Crime • Man was seen wielding samurai sword prior to being killed by police. 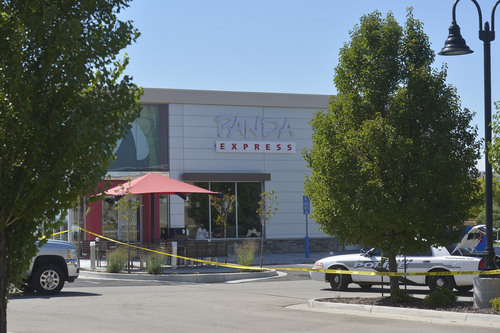 Chris Detrick | The Salt Lake Tribune The scene outside of a Panda Express in Saratoga Springs Wednesday September 10, 2014. A male ó who reportedly was seen wielding a samurai sword ó was shot and killed by police in Saratoga Springs on Wednesday morning. 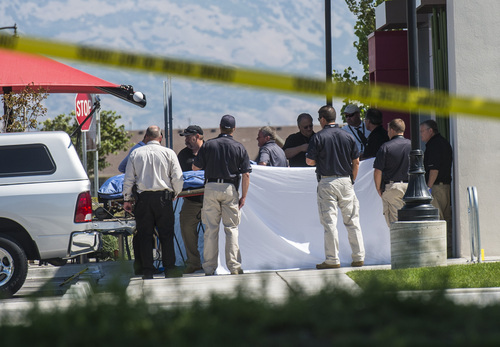 Chris Detrick | The Salt Lake Tribune The scene outside of a Panda Express in Saratoga Springs Wednesday September 10, 2014. A male -- who reportedly was seen wielding a samurai sword -- was shot and killed by police in Saratoga Springs on Wednesday morning. 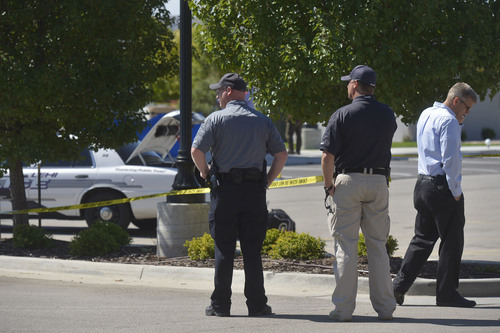 Chris Detrick | The Salt Lake Tribune The scene outside of a Panda Express in Saratoga Springs Wednesday September 10, 2014. A male ó who reportedly was seen wielding a samurai sword ó was shot and killed by police in Saratoga Springs on Wednesday morning. 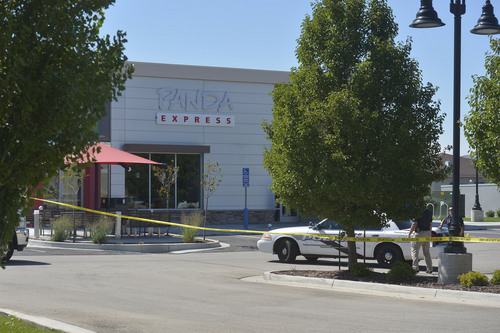 Chris Detrick | The Salt Lake Tribune The scene outside of a Panda Express in Saratoga Springs Wednesday September 10, 2014. A male -- who reportedly was seen wielding a samurai sword -- was shot and killed by police in Saratoga Springs on Wednesday morning. 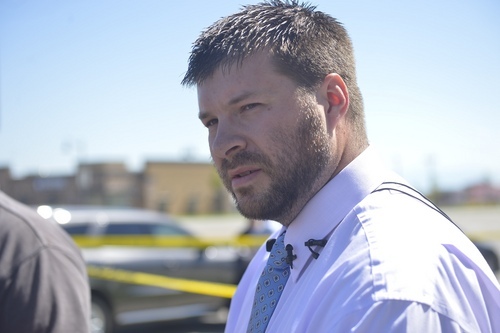 Chris Detrick | The Salt Lake Tribune Saratoga Springs Public Relations Manager Owen M. Jackson speaks at the scene outside of a Panda Express in Saratoga Springs Wednesday September 10, 2014. A male -- who reportedly was seen wielding a samurai sword -- was shot and killed by police in Saratoga Springs on Wednesday morning. Chris Detrick | The Salt Lake Tribune The scene outside of a Panda Express in Saratoga Springs Wednesday September 10, 2014. A male -- who reportedly was seen wielding a samurai sword -- was shot and killed by police in Saratoga Springs on Wednesday morning. 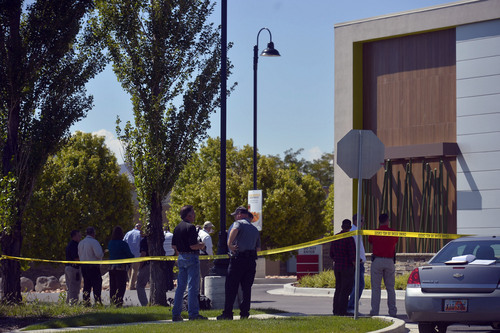 Chris Detrick | The Salt Lake Tribune The scene outside of a Panda Express in Saratoga Springs Wednesday September 10, 2014. A male -- who reportedly was seen wielding a samurai sword -- was shot and killed by police in Saratoga Springs on Wednesday morning. 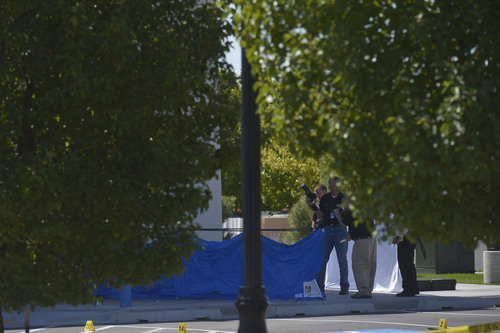 Chris Detrick | The Salt Lake Tribune The scene outside of a Panda Express in Saratoga Springs Wednesday September 10, 2014. A male -- who reportedly was seen wielding a samurai sword -- was shot and killed by police in Saratoga Springs on Wednesday morning. 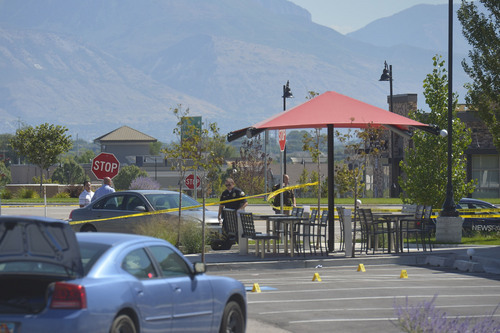 Chris Detrick | The Salt Lake Tribune The scene outside of a Panda Express in Saratoga Springs Wednesday September 10, 2014. A male -- who reportedly was seen wielding a samurai sword -- was shot and killed by police in Saratoga Springs on Wednesday morning. 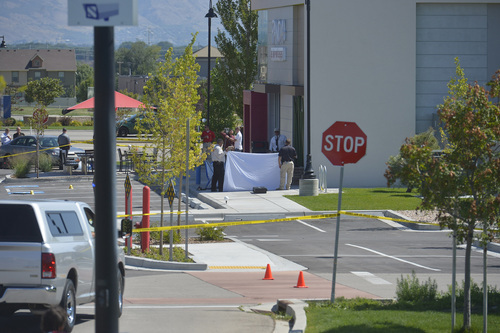 Chris Detrick | The Salt Lake Tribune The scene outside of a Panda Express in Saratoga Springs on Wednesday. A man who reportedly was seen wielding a samurai sword was shot and killed by police in Saratoga Springs on Wednesday morning. Chris Detrick | The Salt Lake Tribune The scene outside of a Panda Express in Saratoga Springs Wednesday September 10, 2014. A male -- who reportedly was seen wielding a samurai sword -- was shot and killed by police in Saratoga Springs on Wednesday morning. 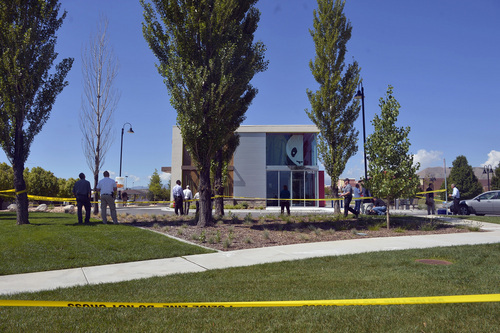 Chris Detrick | The Salt Lake Tribune The scene outside of a Panda Express in Saratoga Springs Wednesday September 10, 2014. A male -- who reportedly was seen wielding a samurai sword -- was shot and killed by police in Saratoga Springs on Wednesday morning. 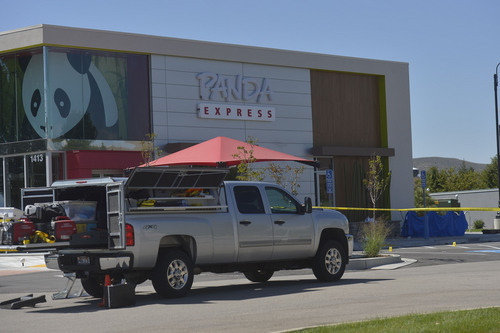 Chris Detrick | The Salt Lake Tribune The scene outside of a Panda Express in Saratoga Springs Wednesday September 10, 2014. A male -- who reportedly was seen wielding a samurai sword -- was shot and killed by police in Saratoga Springs on Wednesday morning. 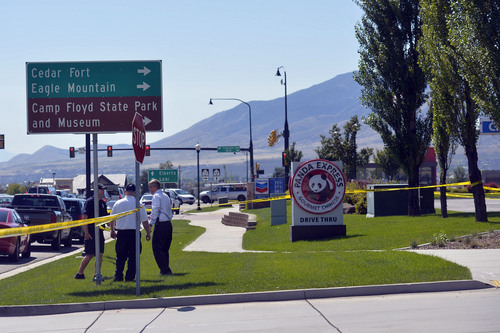 Chris Detrick | The Salt Lake Tribune The scene outside of a Panda Express in Saratoga Springs Wednesday September 10, 2014. A male -- who reportedly was seen wielding a samurai sword -- was shot and killed by police in Saratoga Springs on Wednesday morning. 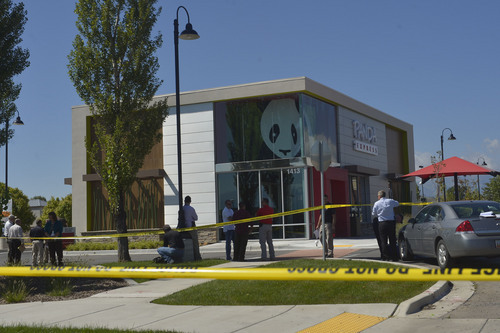 Chris Detrick | The Salt Lake Tribune The scene outside of a Panda Express in Saratoga Springs Wednesday September 10, 2014. A male -- who reportedly was seen wielding a samurai sword -- was shot and killed by police in Saratoga Springs on Wednesday morning. Saratoga Springs • A 22-year-old man  who earlier was seen wielding a samurai sword at a convenience store  was shot and killed by police in Saratoga Springs on Wednesday morning. 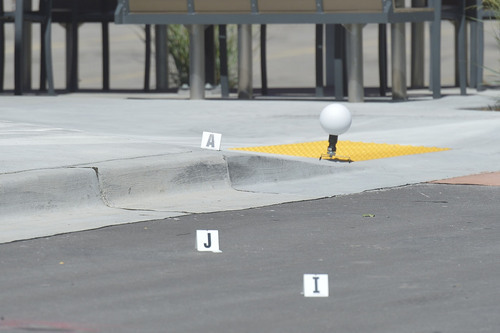 The Saratoga Springs shooting occurred at 9:40 a.m. Wednesday near the Top Stop Convenience Store, located at 36 W. State Road 73. Glenda Shearer told The Tribune that she talked to a Top Stop employee who told her the suspect was waving a samurai sword around outside the store. 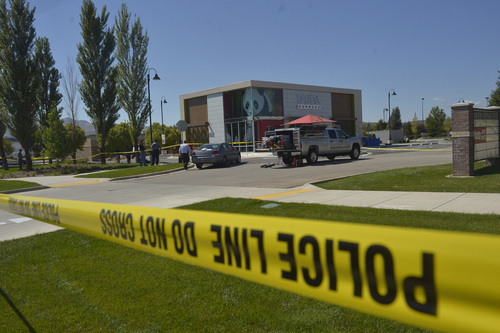 Owen Jackson, public information officer for Saratoga Springs City, confirmed that the shooting occurred after officers responded to a report of a suspicious person in the area  a person who reportedly had a sword. But Jackson declined to say if the man had the sword at the time of the shooting. "There was a weapon involved," he said in response to questions from news media. Two police officers were placed on leave following the shooting. But Jackson said he did not know if both officers had fired their weapons. Jackson said the victim&apos;s next of kin had been notified of his death but that officials were not immediately releasing his name. The Utah County Attorney&apos;s Office was investigating.